Last Post for Britain’s Post? Posted June 21st, 2012 by David Porter & filed under MailBigFile, Social. Snail Mail Consigned to History? When the cost of posting both first and second class letters rocketed in late April, many observers predicted the end of the postal services in Britain as merely a year or two away. The economic justification for the rises seemed to be that the business was losing revenue through falling volumes brought about because of technology, so therefore the price of the service must massively increase to protect the future. Economically illiterate was the response of many. Falling sales mean you have to reduce your prices, surely? However, the truth is that even that may not have been enough. Three years ago, Fox News in the USA speculated that the ‘post office could be going the way of the pony express’. Postmaster General John Potter had threatened to cut mail delivery from six to five days a week, as the outlook for mail services was ‘bleak’. It was fast becoming apparent that ‘we don’t really rely on mail the same way we do today as we did five, 10 years ago. Our expectations of postal service are different from a generation ago’. E-commerce had begun to take its toll. Since then, it has escalated. In the UK, to open up the Royal Mail prerogative and public service obligations to competitors may help the market a little, but it can only be short-lived and may accelerate the service decline. In the past 6 years, the volume of letters sent each day in Britain has dropped almost a quarter, from 84 million a day to 59 million. Royal Mail has lost a billion pounds in the last four years. Ofcom’s Director of Competition, Stuart McIntosh said: ‘The mail services that we have benefited from over decades and centuries are fundamentally at risk’. The Royal Mail has a defined benefit pension deficit of £9.5 billion and growing in its fund with 450,000 members, the largest scheme by membership in Britain. Part-privatisation plans may or may not be fulfilled, but the whole in the pension funds is a serious constraint. Such a deficit stands in the way of potential investors buying the postal business. The Government plans to take over the scheme, cashing in on assets and selling off the enterprise. Adding the £28 billion assets to Government books should enable the Chancellor to cut the annual deficit and reduce borrowing costs of Government spending. In January, the Government announced a 10 year deal, according to The Independent (Jan 12), ‘giving certainty to postmasters. The long-term arrangements between the Post Office and the Royal Mail will be reached before the two are separated under the Government’s controversial privatisation plans’. The postal services have long been divisive political issues. 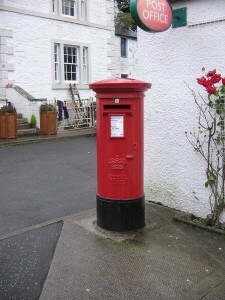 Overmanning, modernisation of sorting mail, health and safety of postmen and women, the survival of subpost-offices have also been, and still are, social issues for our times too. But services cannot be conserved with public cash for nostalgic reasons. Harsh economic reality has to be balanced with social need. In an age of economic austerity, who wants to send personal letters, when emails and texts are quicker and cheaper? Who wants to post business documents when they can be emailed and the recipient prints them off instead? And who now would choose to send holiday postcards, Christmas and birthday cards? Get well soon, sorry you are leaving, happy retirement, well done on getting married/having a baby/passing your driving test? Yes, such cards still sell in their millions and many are posted. But can many people guarantee that cards will be as popular in a decade’s time? Does the postal business actually have a future? What of appointments, writs, invoices, cheques, advertising, complaints? Does the mail order sector have a realistic tomorrow? Or will parcels be different to transport shopping rather than correspondence? What of the knock-on effects on other businesses? The early summer difficulties of Clinton’s Cards with their 700 plus shops and 8000 staff on Britain’s high streets illustrates the problem. High rates and rents on long leases on top of massive debt have made the slide of the company, possibly as inevitable as Woolworth’s, MFI and others already forgotten. WH Smith, Paperchase and all the major supermarkets are serious rivals in the cards and related materials market. Internet players such as FunkyPigeon.com and Moonpig have both personalised and made the card buying and sending process into ‘fun’. These internet methods are also easier to do business with, they are more consumer friendly than high street and posting: your choice, no postage, no stamps, no hassle. As easy as ordering a birthday present from Amazon – order it, pay for it and it is delivered to the recipient gift wrapped. John Humphreys discussed whether the Royal Mail’s future is ‘worth the price of a stamp’ on YouGov in March 12. He said: ‘the future for Royal Mail does not lie with ‘social mail’ which now accounts for only 10% of Royal Mail business. The rest is made up of correspondence from government, business and charities and from parcel-delivery’. That this sector can only grow in the digital future is what the hopes, dreams and future of not just the Royal Mail, but an essential strand of the financial and social fabric of this nation is depending. John Humphreys, YouGov, March 2012.